The Wind River presents Yukon wilderness at its best.Our trip begins from Mayo with a dramatic floatplane flight over the Wernecke Mountains to McClusky Lake. After a short portage of gear and equipment, we begin a journey into solitude and adventure. The Wind is a meandering river that periodically braids its way to the Peel River. You will be captivated by the extraordinary clearness and colour of its water. The river is mostly a Class I/II river, characterized by riffles, tight corners and the occasional powerful eddy. As such, it is best suited to paddlers who have had river experience and are comfortable with river paddling strokes. The surrounding ridges are ideal for hiking. A few layover days have been scheduled to take advantage of the scenic vistas that these ridges offer. The wild country that the Wind courses, is home to sheep, goats, caribou, elk, beaver, wolf, eagles, falcons and more. It would be surprising if a number of these were not encountered during the paddle. At the Peel River we will be met by our floatplane and returned to Mayo. This flight will give us an excellent view of the Wind River. Included:Transportation from the point of origin and return, charter air flights, camping fees, cooking gear, camp stoves, tents, meal preparations, canoes, canoe carts, paddles, life jackets, canoe dry bags, meals/snacks/beverages on the expedition, tarps, major first aid supplies, emergency radio or satellite phone, and professional guides. Meals: All food while on the canoeing portion of the trip. Day 0: Arrival in Whitehorse, Yukon. This denotes the day or days spent in Whitehorse before the listed start date of the trip. Day 1 – Transportation from Whitehorse to the town of Mayo where we will fly by charter to McCluskey Lake. A picturesque mountain setting, with an old cabin, serves as our first campsite. Day 2 – We will use the morning to review our paddling technique on the lake and to portage our gear a short distance to a creek in preparation for setting out on our adventure. An afternoon of lining our canoes will bring us to the Wind River and our campsite for the evening. And thus begins our 280 km (165 miles) journey down the Wind River. Days 3/13 – Our days on the river will take us through some incredible Yukon wilderness. Campsites have been selected to optimize the best of the Wind. We have set aside some non-paddling days to hike some of the mountain ridges that parallel the river. 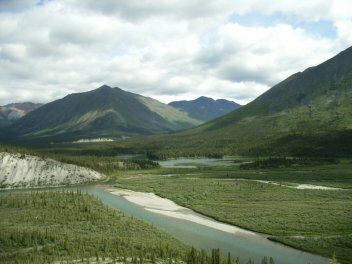 This is also a prime wildlife area with sightings of caribou, sheep, bear, eagles, and a myriad of mammal and bird life very possible. We will eventually join the Peel River, passing both the Bonnet Plume and Snake Rivers confluence, and camp on a gravel bar in preparation for our return flight to Mayo. Day 14 – Our air charter will return us to Mayo and from there return to Whitehorse.